Inspire hard work and celebrate the success she's accomplished with the cello girl personalized Christmas ornament that is very cute and made from quality resin, so it will look just as good in years ahead when it's a cherished keepsake. These musical instruments ornaments arrive with a holiday cord attached for easy display wherever it makes her smile. Our lettering artists will add her name where shown, but in a pretty font. The year can be included too. Like many of our high-quality resin girls ornaments personalized by hand, the girl cello player personalized Christmas ornament arrives in our attractive velvet gift and storage bag. Ornament description: This cute ornament features a brunette girl and her cello. 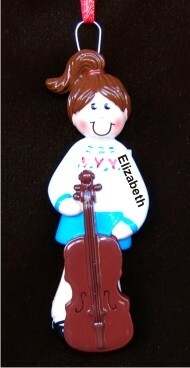 Personalize the cello ornament with her name, and the year at your option. Arrives in our velvet bag to make a great gift.